The National Museum of Kenya (whose proper name is the Nairobi National Museum) is a museum in Nairobi. It appears in Mario is Missing! as one of the city's three landmarks. 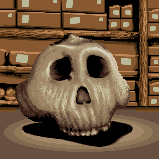 In the game, it has been closed due to a three million year-old Human Skull being stolen by Koopa Troopas, and it is Luigi's task to find and return it, proving its authenticity by answering questions about the museum and the skull (seen below). He is rewarded $2800 for returning it, plus $3200 bonus if he returns it first. Anthropologists think Kenya may be the birthplace of mankind. Why? How old is that skull you're holding? Who discovered that skull you're holding? Anthropologists believe Kenya to be the birthplace of all mankind. Scientists working there have dug up some of the oldest human fossils ever found. One skull found near Lake Turkana is said to be almost 3 million years old! The plains of East Africa -- Kenya, Tanzania and Ethiopia -- are being eagerly excavated to try and solve the mystery of where human beings first lived. Although the game describes the human skull as being "almost 3 million years old", this information is based on an incorrect estimation; the actual skull found by Leakey is estimated to be roughly 1.9 million years old, and furthermore assumed to have belonged to a species known as homo rudolfensis, not homo habilis. This page was last edited on August 12, 2018, at 21:41.